Hi, foodies...Welcome to AYESHA'S KITCHEN. 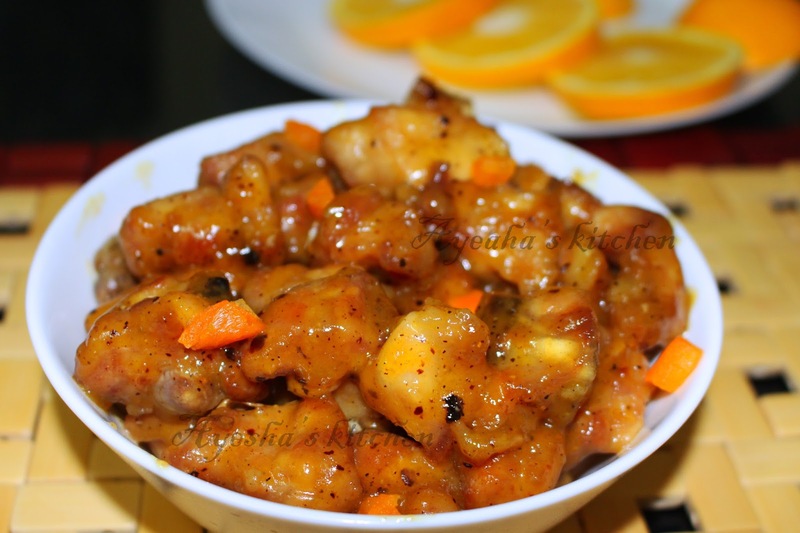 Here is an Orange chicken recipe. Orange chicken is mainly a North - American dish consist of chopped, battered and fried chicken pieces in the sweet orange flavored chili sauce. While, now this dish is very popular in US, found in different variations. As orange chicken sauce recipe is quite simple to make at home, i prefer making this yummy dish at home more often. Orange chicken has also become Chinese restaurant favorite these days. So let's know how to make the best homemade orange chicken with amazing sweet and savory flavor, same like the restaurant style version. Here is the recipe showing how to make healthy orange chicken/recipe orange chicken / soft and crispy orange chicken/lunch meal / quick lunch ideas. Orange juice - half a cup ( take juice from sweet orange by squeezing only, Do not make juice in a blender or do not use bitter oranges). Orange syrup/marmalade - 1 tbsp for the glaze. Orange syrup can be made by heating 2 tbsp of orange juice, a bit sugar till it becomes a thick syrup. Marinate the chicken pieces with soy sauce, pepper powder, garlic powder/paste, cornflour and salt for 15 minutes. Heat oil in a wok and deep fry the chicken till golden. Set aside. Heat 1 tsp of oil in a pan and add orange juice, orange syrup/marmalade, soy sauce, cornflour, sugar, a pinch salt and whisk till it thickens. Now add the fried chicken pieces into the sauce and toss to coat. Let the sauce come to boil and when done remove from flame.